In three years, I’ve probably passed through Lungi 18 times. On 17 occasions, I ventured no further than the airport, helipad, hovercraft launch, or ferry terminal. Once, I spent six hours in the Lungi Airport Hotel before my 5 a.m. Royal Air Maroc flight. Never did I consider exploring beyond that. But now I know: Lungi has treasures of its own. Just 45 minutes from the airport, and a lifetime removed from the bustle of town, lies the idyllic getaway of Sierra Paradise. On a recent visit, we followed the owner, Sammy, down a dirt road through dense tropical forest until we emerged suddenly in an impossibly bright clearing, the sun brilliant off the white sand. Spread across the clearing, dotted amongst a handful of palm trees, were five candy-colored bungalows. And beyond, the parallel lines of beach, water, and sky. 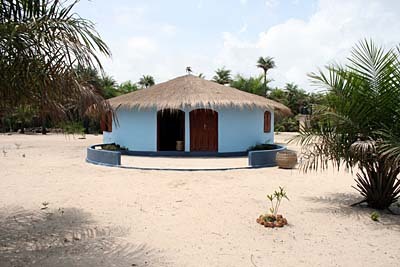 The bungalows alone were welcoming enough – constructed in a traditional style, with round walls and neatly-thatched roofs, but like no village homes I’ve ever seen. Each was painted in an almost impossibly cheery color – one peppermint red, another buttercup yellow, a third the color of the mid-day sky – and the thatch roofs were topped by abstract sculptures. 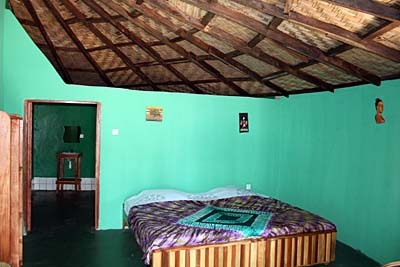 Within each bungalow were two immaculate mirror-image suites, both with a spacious bedroom and modern en suite bathroom. Sammy led us to the sky-blue bungalow. Inside, his attention to detail and love of his native Sierra Leone were both on display. The curtains fluttering in two open windows were gara-died blue in shades of ocean and sky, as were the sheets and bedspread on the enormous bed and the cushions on the wicker chairs nearby. Carefully-selected works by local artisans livened the room and its adjoining bathroom, and woven lightshades softened the fixtures hanging overhead. Even the curtain rods were noticeably beautiful – lengths of reed, natural and warmly polished – and on the bathroom sink lay both traditional African hair combs and squares of lavender-scented French soap. The sink accoutrements were just one hint of Sammy’s own background. Born and raised in Freetown, he has lived the last 15 years in France and now divides his time between the two countries. He returned to Sierra Leone to create this boutique resort, with an emphasis on cultural tourism and the amenities to please an international crowd. “I’ve spent time overseas,” he said. “I know what they want.” And yet he also aims to expose visitors to what Sierra Leone has to offer. Thus, Sierra Paradise serves traditional dishes like groundnut stew and cassava leaf, but made with vegetable oil instead of palm oil (to appeal to foreign palates) and with fresh shrimp, fish, and tender beef. To accompany dinner, Sammy offers French wines and real-brewed coffee, but also freshly-tapped palm wine. “From God to man,” he said. Food and drinks are served in an open barrie-style dining area, with a half-moon bar at one end decorated by a colorful mural and ringed by tall stools. From the bar, we could peer through the palm trees to the beach beyond. A short walk brought us through the long beach-side grass – I’d call it dune grass if I were in New England – to a narrow strip of sand. To either side, we could see nothing but the narrow palm-lined white sand beach stretching for miles. 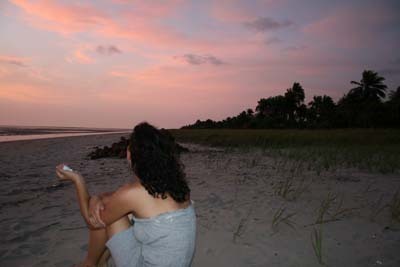 Ahead of us was a vast mud flat, rippling like water and shimmering in the sunset, stretching almost to the horizon. Scattered across the mud were a handful of fishing boats, abandoned by design or by chance to await the rising tide. I wandered out across the mudflat, collecting seashells and peering in tide pools, until the setting sun drove me back toward the sand. At one point a family passed by on a motorbike – a mother, father, and three children – following the line of palm trees to return to their village. The soft hum of their bike was the only disruption to the utter peace and quiet. I couldn’t remember when I’d last been so relaxed. Later, listening to music and drinking palm wine, Sammy told us about his plans for the resort. Tours of the neighboring villages. Performances of traditional music and dance. A chance to fish with local fishermen. I suggested he include a visit to the nearby palm-wine bar, down the road from the resort. When we’d stopped there earlier that day to pick up refreshments for the evening, following Sammy down a narrow footpath through the thick bush to a tiny shaded clearing, we found a dozen men and women drinking palm wine from used plastic water bottles. Though the conversation slowed when we arrived, I was sure it would have picked up again once we settled in, and I vowed to return. All-in-all, Sammy has put together a beautiful retreat from the bustle of city life. As we strolled through the clearing the next morning, surprising two acrobatic monkeys playing in the trees by the kitchen, I imagined the resort filled with an array of guests. In the daytime, with the miles of shell-strewn beach and frolicking monkeys, it would be perfect for families. In the evening, when the setting sun shimmers across the mudflats and the soft hum of the tropical forest begins its nightly chorus, it would be a romantic paradise for honeymooners or courting couples. At night, when the stars sparkle in a sky unmarred by urban light pollution, and Sammy plays African and European dance tracks while dishing up large mugs of palm wine, it will offer a playground for young adventurers.